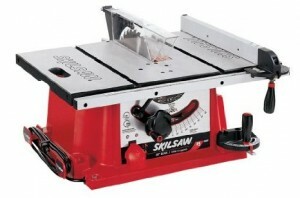 When it comes to buying a table saw – you want to make sure you get it right. A table saw is a big piece of equipment and is a good investment, but you need to be sure that you choose the correct one. This saw will be something that helps you with work for years to come, so take the time to choose the right one. 3 650 2-1/4" / 3-1/8'' 29" x 21.5"
My Review 26-1/2" / 95-1/4"
4 800 2-1/4” / 3-1/8” 26-1/4" x 22"
5 000 2.5" / 3-1/8'' 22.5" x 20"
My Review 18" / 8.5"
3 650 2-1/4" / 3-1/8'' 44" x 27"
My Review 30" / 12"
5 000 2-1/2" / 3-1/2" 26" x 20"
My Review 24.25" / 12"
If money is an issue and you’d like to start cutting wood quickly and cheaply, the SKIL 3410 table saw would be my first recommendation. Comes with a quality self-aligning rip fence which is great for beginner woodworkers and also a very large table considering the price tag. The portable design also makes it easy to lug around and it won’t take up much space, which should be of great importance to anyone who doesn’t have a dedicated workshop. If you decide to go with this model, make sure to read my review of the SKIL 3410 first and learn about its shortcomings, too. What Do The Best Table Saws Have In Common? There are certain things in table saws that you should look for. Here are some of the biggest ones below. 1-2 hp motors will be more than plenty for a hobbyist and D.I.Y furniture maker or home renovator. For more serious applications such as commercial work, a 3-5 hp motor is recommended. Take note that most 3+ hp saws will not work on normal phase power in a residential home. Using a table saw results in a lot of dust. If you only plan on using it sometimes, you will be able to focus on other desired features, but for a serious woodworker, you will definitely appreciate having a good dust collection option. Some table saws are more tricky to use than others. If you are inexperienced with table saws, make sure you choose something that is specifically easy to use so that you don’t end up in over your head. Most power tools have some inherent danger, and table saws can be extremely dangerous if not respected. Make sure that you select a table saw with the appropriate safety features. What Type of Table Saw Is Most Suitable For You? Before you decide on buying a table saw, make sure you learn a little about how to safely use them. I can’t stress how important this is, and the above article will definitely get you going in the right direction. Contractor table saws are often heavy and have a stand which they are mounted on. Sometimes there will also be an option for wheels to make it more portable around a workshop or garage, but they are definitely not made to be a portable tool. Often contractor saws will be direct drive (driven straight off a motor), or belt driven from the motor. These saws generally use the same phase power as a typical household, so they are popular with hobbyists and small project joinery and woodworking businesses. These are big enough to do some good sized projects, but small enough to keep in a garage. These saws are designed to be lightweight and easily transportable from site to site. Portable table saws are often direct drive so there are no pulleys or belts to worry about, and plenty of power. The width of a portable saw however is narrower than a bigger cabinet or contractor saw, so the width of timber that can be sawn is reduced. These saws can also incur more vibration than other larger saws during cutting. The best cabinet saws are often big, heavy and rigid. They are made for serious work, and due to their size they don’t get the vibrations that smaller saws do. They have good dust collection abilities due to their style and are often easier to adjust. Most commonly these saws use a 10” blade, and often have a good amount of safety features built in. These saws are too big to fit in a normal sized garage – unless you want to park your car on the street, but they do the job very well. Hybrid saws are a combination of contractor saws and cabinet saws and attempt to pull the benefits of these two different saws together. They are often enclosed in a cabinet to help dust collection, but are designed to be more like contractor saws. 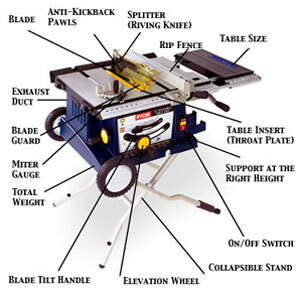 We can group table saws into two further groups – portable and non portable saws. This can make it a bit easier if you are new to the industry and want to get a quick grasp on what is what. What Safety Features Should You Look For On A Table Saw? We’ve already talked about safety with table saws, but which safety features should you look for? If you are just going to be using this saw alone, you should give serious thought to getting one which has plenty of safety features as the thought of getting into an accident without workers around to help is not pretty. Proper initial setup of the saw is also of vital importance in avoiding a serious injury. This is the number one feature to think about when buying a new saw. A riving knife or a splitter is something to consider, and most operators suggest choosing a riving knife. A riving knife stays in place for more cuts, so the chances of wood getting thrown out are a lot lower. Switching the saw off with the foot, knee or hip is an important function to be able to perform for some cuts. This ensures safety stays at the top of the list. If a table saw loses power, the saw will stay in the “on” position. When power comes back on, the saw can start back up without warning which creates a major safety flaw. A magnetic switch will turn the saw off as soon as it loses power, and you will need to flick the switch back to “on” again. When choosing a table saw you need to have a think about what you are going to be using it for most of the time. Choosing a saw just because it is cheap won’t help you achieve your goals. Besides, the very cheapest table saws will typically come with few accessories and you’ll often end up spending a lot more money just to get all of the essential items required. Most woodworking organisations will have a quality cabinet table saw. The work comes to them and there is no need to transport the saw. However a lot of joinery work does need to be done “on site”. For this, a benchtop saw would be a good addition. If you are wanting a table saw to help with small projects around the house, a benchtop saw would be a good choice. If however you are wanting to do larger projects such as making your own doors, you might need a contractor or hybrid saw. Either way, make sure to read our beginner’s guide to using a table saw. Which Specs On A Table Saw Are Most Important To Look For? In a workshop the table saw is probably the most used saw. Knowing this, it is important to choose one with the right specs seeing as you will use it most frequently. The blade size (cut depth) is one important aspect to think about. Most saws come equipped with a 10” blade, however some models will come with a bigger 12”. The size is not too important unless you plan on cutting huge bits of material, but the quality of the blade is of utmost importance. You can purchase blades for everything from cutting metals and plastics through to plywoods. Getting a carbide tipped blade is always a good idea, as is having a few different blades for different applications. Using a direct drive vs belt driven is also something to think about. A direct drive is less maintenance, but belt driven motors normally last longer and keep sawdust out of the motor as they are located away from the action. A belt driven motor will however need more maintenance than a direct drive. You can get adjustable blade angles for bevel cuts which can be incredibly useful when ripping wood for furniture, mouldings and other designer pieces. Left tilt and right tilt are more of a personal preference as to which way you are used to cutting angles. You will want to spend the money to equip your saw with a quality fence. This is the part that your material sits up against while you guide it through the blade. Having a fence that adjusts easily and accurately is key to getting a perfect cut. A good quality fence is something that will set you apart from a cheap saw. This is arguably one of the most important parts, because if you can’t align the fence properly, your cuts will all be wrong. Make sure that you get a saw with a tabletop that has been machined well. The normal standard is to have it true within 1/1000 of an inch. Stands, laser guides, hp and RPM of the motor and the fence size all need to be considered. Are you going to purchase a saw with a laser guide, or get one with a quality fence and higher quality finish so that you shouldn’t need one? These are all questions you need to ask about your own woodworking skills and your personal preferences. And remember, even the best table saw is only as good as its owner. Make sure to properly maintain your saw to gain the most out of it in your workshop. What Brand Table Saw Is The Best Choice? You can purchase some table saws from lesser known brands for a cheaper price; but do you want to take the risk? A known and trusted brand gives you more peace of mind as they have been proven to last, but a cheaper brand will save you money and possibly allow you to get more features for the same price as a more expensive brand. This is something to think about, and if you are loyal to a brand, it might make sense to you to stick with the brand for interchangeable parts or other benefits. Just remember, features of a saw are not everything, this is where build quality comes into play. With a more established brand name you are buying durability, reliability as well as a respected warranty and the ability to easily source replacement parts. Make sure to check out our list of table saw ranking categories for more recommendations. Actually, Contractors saws were originally made to be portable.